FRANTOIO PRUNETI MORAIOLO ORGANIC: A monovarietal extra virgin olive oil from Frantoio Pruneti pressed from 100% Moraiolo variety olives grown in the Chianti area of Tuscany. This oil is intended to enhance the green, balsamic and very spicy notes that are typical of the Moraiolo variety. Strong notes of radish, almond, nuts, nutmeg, oregano and dried fig lead to a spicy, powerful black pepper finish. Recommended for cooked fish, white meat, grilled vegetables and drizzled over fresh, sweet cheeses. Most suitable for complex dishes, especially cheese-based. TERRE FRANCESCANE ORGANIC: The Terre Francescane Biologico extra virgin olive oil is obtained from a selection of the best organically grown olives from Umbria, carefully selected by Tiziano Scacaroni and certified by the Instituto Mediterraneo di Certificazione. The oil is emerald green and pleasantly pungent with a strong aroma of mature olives and a slightly almond aftertaste, ideally suited to dress vegetables, bruschetta, soups and meats. 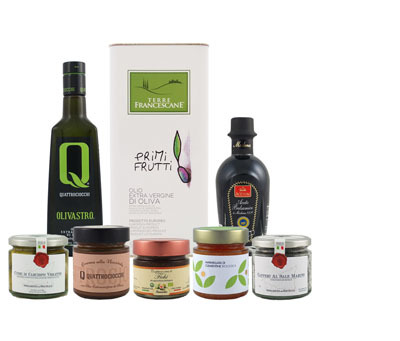 GUGLIELMI FRUTATTO ORGANIC: This organic extra virgin olive oil is obtained without the use of pesticides and fertilizers, using attentive care for the environment and nature by safeguarding the territory from which it is obtained. Obtained exclusively from Coratina and Peranzana olives and rich in healthy polyphenols, this oil is dense and full bodied, distinguished by its fruity green notes of medium intensity with a touch of spiciness. Herbaceous nuances characterize its aromas, which are dominated by strong green notes of fresh herbs, artichokes and garden vegetables. Use this oil with roasted meat, grilled vegetables, bruschetta, pizza and full-flavored sauces and as a condiment for game, meat or beef carpaccio. TERRE DI SAN MAURO ORGANIC: A wonderfully balanced blend of organically grown olives of Calabria, this extra virgin olive oil has a delicate fruity bouquet with hints of herbs, green apple and green tomato. The taste is delicate, fine and deliciously well-balanced.